Which Comes First - Data Collection or Data Analysts? “What came first, the chicken or the egg?” While this is a classic philosophy question can be asked a thousand different ways, the current trend in data analytics is “what came first, the data or the analysts?” On the one hand, you need analysts to understand your data, and on the other you need data in order for your analysts to have a worthwhile purpose at the company. However, in a recent study from Horses for Sources in which they took a look at current business focuses, that question of “data or analysts” might finally have an answer. According to the study conducted by Horses for Sources, there’s been a significant importance focused towards using automation to gather data and drive better business results. 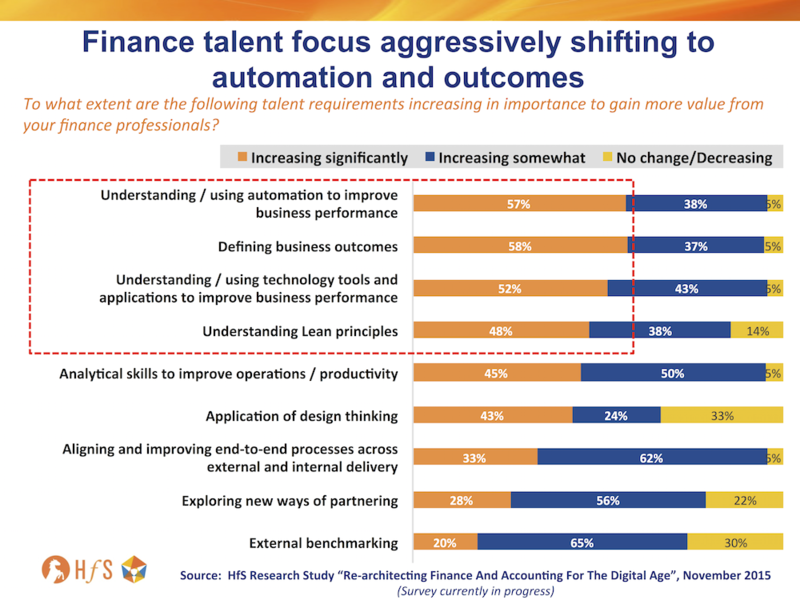 As you can see in Horses for Sources graphic, “understanding/using automation to improve business performance” only second to “defining business outcomes” with 57% of those surveyed saying that using automation is “increasing significantly” in importance. Additionally, “understanding/using technology tools and applications to improve business performance” was almost just as significant, with 52% of respondents saying that was increasing significantly in importance as well. Overall, the collection of data for analytical and business outcome purposes received the highest amount of “increasing significantly” responses. Notably, this trumped “analytical skills to improve operations/productivity” in significance. So, in the “data vs. analysts” discussion, data has clearly won out. While this study focused on financial staff members, there’s a lot to be said about hiring from this information. The key takeaway from this is that automation and data collection is critical, and trumps even having a team who can disseminate the information. While it’s still crucial to be able to understand the data, just having the data is crucial. In the case of talent analytics this rings true from the initial step in the hiring process to the day the employee leaves the company. Automating your data collection is critical because it allows you to evaluate what you’re doing in your hiring process that can target better employees, drive better results, and create a better hiring experience, among many other benefits. Furthermore, using hiring assessments means you have the perfect chance to put automation in place without having to “re-invent the hiring wheel” of your organization. Overall, the data you collect will be a crucial factor in helping you define business goals, as it will tell you what’s working for your hiring efforts and how that’s influencing your business results.